Help with a community event such as Earth Celebration Day & Festival of Art, Youth Festival, Jazz Fest, or Halloween Storytelling (set up, serve food, run an activity, park cars, clean up, etc.). Help with a fundraiser such as Recycle/Reuse Yard Sale, Chesapeake Bay Supper, Salamander Scramble, or Pumpkin Festival (set up, serve food, run an activity, park cars, clean up). Assist with office duties (mailings, filing, organizing, copying, assembling packets, etc.). Assist with a workshop or other program (set up, provide extra hands to help participants, clean up). Help prepare school program materials and props. Make things grow in our Pennsylvania German 4-square garden! All sorts of gardening tasks from spring to late fall. 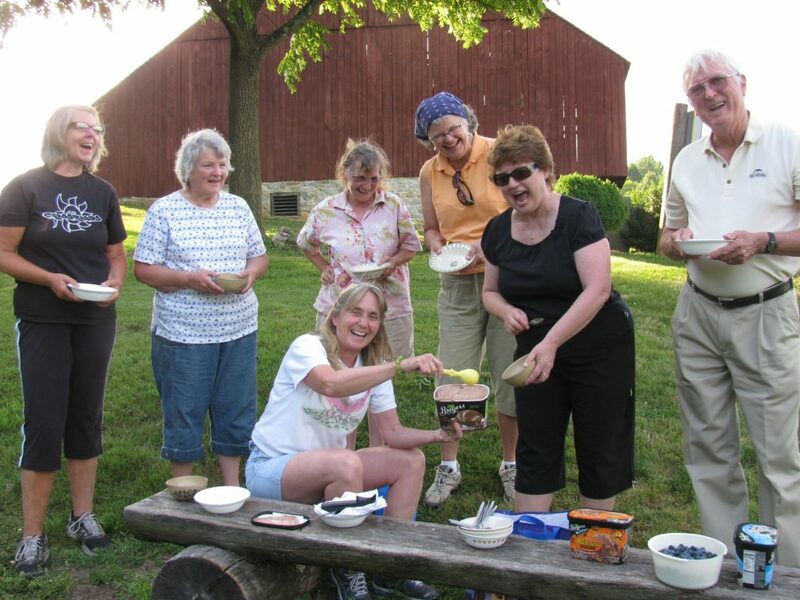 Garden volunteers take a break with ice cream and fresh blueberries.